The 18th Battalion Durham Light Infantry was raised at the County’s own expense and held in special regard as the ‘County’ battalion. A homecoming parade was held in Durham city on 27 May 1919. 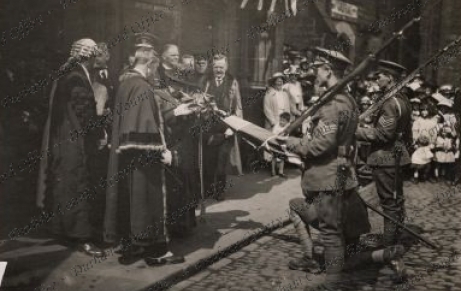 The battalion paraded in front of the town hall in the Market Place where a large crowd watched as 120 members of the battalion were welcomed home. Mrs Helena Shafto, of South Bailey, Durham, who had served as honorary secretary of the DLI Prisoners of War Fund, placed a laurel wreath on the end of the King’s colour before it was laid up in Durham cathedral.